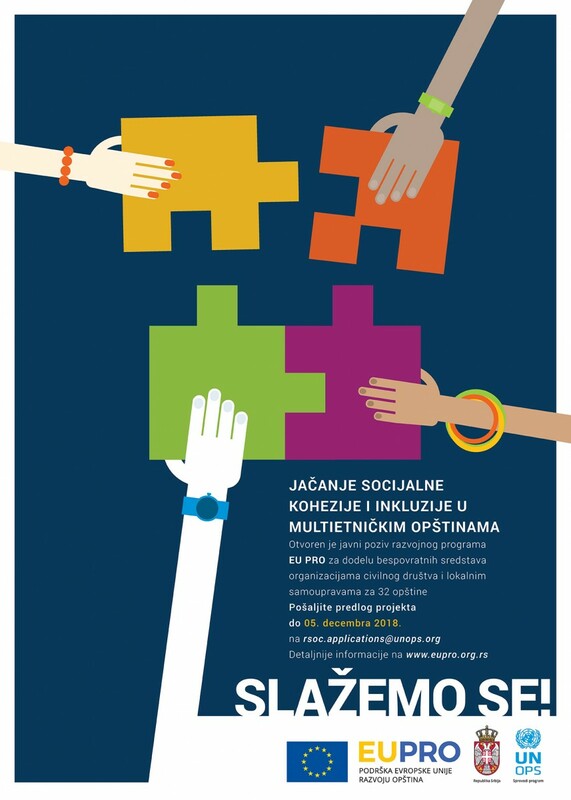 The EU PRO development programme has published the Public Call „Piecing Together“ for supporting the projects of the civil society organisations and local self-governments aimed at fostering social cohesion in multi-ethnic municipalities in two regions of Serbia: Šumadija and Western Serbia and South and Eastern Serbia. Through this call, the European Union will support projects that contribute to reducing inequalities and discrimination, promoting inter-ethnic understanding and providing equal opportunities for each individual in these communities. The Call is open by 5 December 2018, while 32 programme local self-governments and their institutions, which according to the Law on Local Self-Government are nationally mixed, as well as civil society organizations registered in one of these municipalities and cities are eligible to apply. They may submit project proposals related to improving the socio-economic situation of the vulnerable groups through their economic empowerment and improving access to social and health care, education and other fundamental rights. Additionally, projects can focus on improving inter-ethnic relations and dialogue through enhanced cooperation among communities of different ethnic background, and fostering inter-municipal cooperation between multi-ethnic communities through networking and exchange of experiences and good practice examples. Civil society organizations and local self-governments may also prepare the projects that should contribute to aligning the local policies for national minorities with the national regulatory framework. "Through these projects, the European Union provides support to creation of a society dedicated to the well-being of all its members, a society in which people are protected against discrimination, trust their fellow citizens and institutions and work together for a better future for themselves, their families and their community" Graeme Tyndall, EU PRO Programme Manager said. The individual project may be awarded from 10,000 to 15,000 Euros, while those submitted as partnership may be awarded up to 30,000 Euros. In order to present the Public Call to interested civil society organisations and local self-governments, EU pro will hold info sessions, on 30 October in Kučevo, on 31 October in Bor, on 2 November in Valjevo, on 6 November in Sjenica, on 7 November in Niš and on 8 November in Vranje, while the registration for info session is to be done by email: biljanak@unops.org. More information on the Public Call, selection criteria, application method as well as the application documentation is available on the EU PRO Programme website: Public Call for Proposals for Fostering Social Cohesion in Multiethnic Municipalities. MDULS.gov.rs Law on the Local Self-Government_pdf_SRB according to which the municipalities where one national minority accounts for more than 5% of the total population or all national minorities collectively account for more than 10% of the municipality’s population according to the last census are considered to be nationally mixed.